Now that Gods & Kings has rearranged the tech tree, I decided I would revisit my old Code of Law mod and update it for the new expansion. That updated version is now uploaded onto the Steam Workshop. The new Code of Law technology requires Writing and leads to Philosophy and Civil Service. It allows Courthouses and Open Borders treaties. The primary intent of this mod is to move the Courthouse building away from Mathematics so that players do not gain access to the building that nullifies unhappiness from city occupation at the same time that they unlock the first siege weapon. 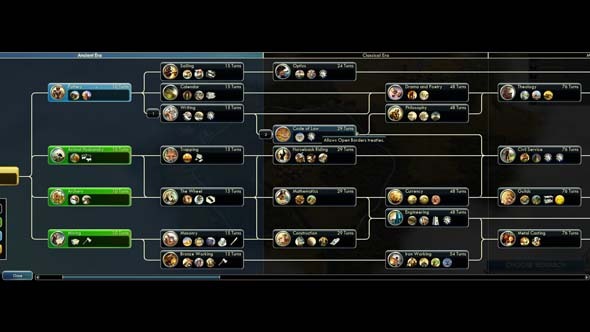 This way, overly-aggressive players who beeline to Iron Working and/or Mathematics so they can capture cities will have to take a minor detour through the culture and science path of the tech tree in order to be able to annex those cities and start using them as unit-farms. First version of my Code of Laws mod for Civilization V is now available! Earlier today, I published my first real mod for Sid Meier's Civilization V. As you may recall, I had previously uploaded a mod as an April Fools joke. But this new one is for real! The mod is titled "Code of Laws (Version A)(v. 1)". As the title indicates, this mod's primary function is to add a new technology to the game, called "Code of Law", and to move the Courthouse building into that technology. My primary purpose for doing this was to deepen the Classical Era of the tech tree. As it stands, the Classical Era of the game's tech tree is only one technology deep. This means that era goes by exceedingly fast! I've seen players and AI tech to the Medieval Era as early as 1000 B.C. in some games. This mod is no longer available since Civilization V has switched to using the Steam Workshop for mods. I plan to eventually upload an updated version of this mod, and will update this post if/when that happens. A new version of this mod designed for Gods & Kings was just released on the Steam Workshop. This version is only compatible with the Gods & Kings expansion, and does not work on the base Civilization V game. I apologize for the inconvenience. Due to a request by Steam user The Octopus Creating New Worlds, I went ahead and published an update to the original version of the mod (for the base game) onto the Steam Workshop.